flower | What is That and How Do I Eat It? What is That and How Do I Eat It? And yes, that’s my son in the corner, judging me for photographing vegetables, or possibly pre-judging me for considering serving them to him. Cut to 1 week later when I could finally crawl out of bed, morning sickness kicking in so the only thing I wanted to eat was toast and jelly beans, and a plastic bag filled with green slime where beautiful greens used to be, and I didn’t want to touch anything new for months. Seriously. My veggie consumption consisted of very plain green salads, the occasional stalk of broccoli, and my beloved illustrious avocado. 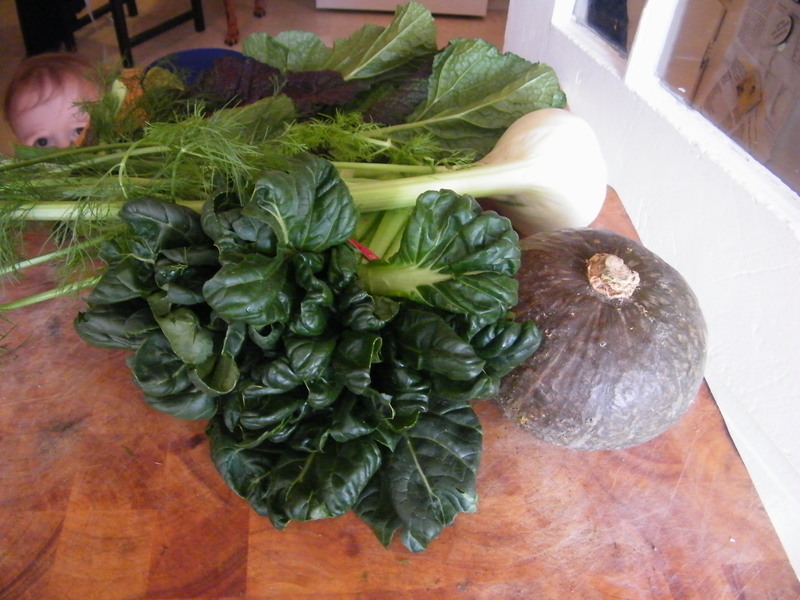 I don’t think I blanched or sauteed or even chopped until the 2nd trimester. 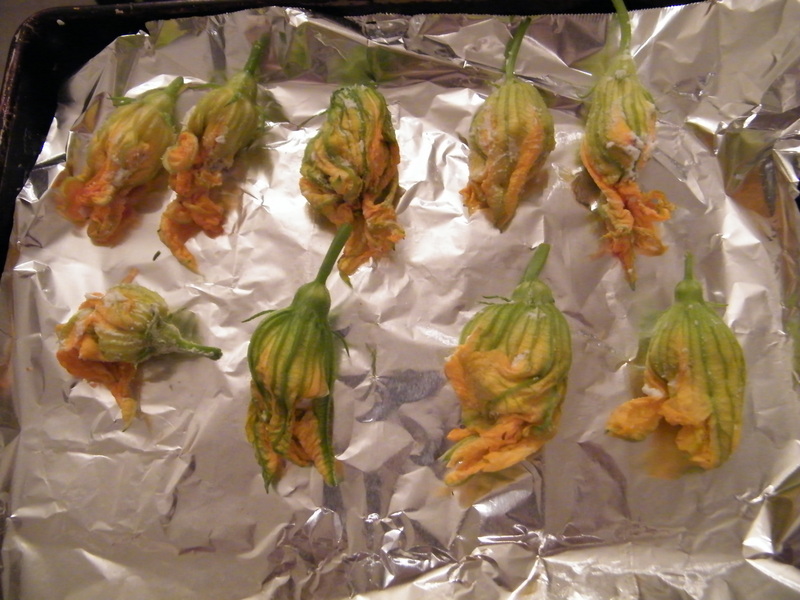 But to come back to the blog with squash blossoms! What a resurrection! See, squash blossoms are pretty much the epitome of farmer’s market glory. They’re extremely perishable and extremely fragile and have a relatively short-lived season and are hugely popular and yet no one grows them for sale, so they’re just, frankly, the elitist little goody two-shoes of the market. You have to get to the market within an hour of opening times to even GET squash blossoms, because all the chefs buy up garbage bags worth and there’s nothing left by 10 am (did I say 10? I meant 11:30) when we’ve finally rolled out of bed. Don’t even try the grocery store. They won’t have them. You’ve got to start when they’re fresh. And I mean REALLY fresh. If you can’t get them at the market, grow your own. Zucchini start by putting forth male flowers, followed by female flowers – the females will grow a zucchini from the base of the flower, so if you want zucchini, don’t pluck all the blossoms in the first flush of growth, or all the blossoms on your plant. Apparently, the ancient Romans loved squash blossoms so much they barely even knew it grew a fruit – they only grew fruit for the seeds and didn’t eat it. They only ate the blossoms, or so says some semi-reputable source. Probably wikipedia. If they’ve sat around in the heat of the morning, they’ll start to wilt – this is what happened with ours, and why there are so few pictures on this post. When they wilt, they get thin, and even more delicate, and they rip ridiculously easily when you try to stuff them. Save the slightly wilted and ripped for non-stuffing uses – they’re still yummy. If they’ve sat around on the counter for a day, they’ll turn slimy. Throw them out. You really have 2-3 days tops from plucking if you put them in the fridge or better yet put their stems in water; otherwise, wait until next market day. So How to Stuff: There’s no other way to say it. You’re going to need a suppository. Take a half tsp of your mixture (we like goat cheese, fresh herbs- especially rosemary- and garlic, but shrimp or crab with ricotta is also extremely rich and delicious) and roll it in your palms until it’s suppository-shaped: mostly oblong and thinner at one end. Open the blossom as carefully as you can, stuff the thin end into the base, and then squish in the fatter end. Twist up the petal tails to close it off, or tuck them under if cheese is oozing out the sides. Most recipes, again, will tell you to remove the pollen stamens first, but w e’ve never bothered. Most also say to destem, but I like the stems – they’re the most vegetable-tasting part of the whole thing, a very tiny, very mild zucchini flavor, and if you’re deep frying, they’re helpful to leave on for plucking the blossom out of the hot oil. But we don’t deep fry. We put them on a piece of aluminum foil on a toaster oven sheet and bake or broil at 400 or 425 until brown on top. If you spray or drizzle with oil first, you can get a little crisp on them, which is divine. And that’s it! They’re basically attractive, labor-intensive, goat cheese receptacles at this point, but they’re oh so good. For the wilted and ripped, put a 1/4-inch of oil in a skillet and flash fry. Toss into a salad for a crouton-y crunch – salads meant for warm dressings, like spinach or arugula, fare the best with the addition of hot veggies, and you can use some of the leftover oil in the skillet to make a hot dressing – or, better yet, toss with pasta and whatever you would have used to stuff them with if you hadn’t been too busy to get to them the day you bought them. You can douse them in a bit of egg before you fry to help them hold their shape. Blossom Day 2 dinner was pasta with chopped bacon, shredded chard, goat cheese, and flash-fried squash blossoms, tossed only with rosemary-infused olive oil. It was so good we actually fought over who got the last squash blossom. IN A MEAL WITH BACON. That’s pretty impressive. Trim? Most people recommend trimming off the stem and pulling out the stamens, especially if they’re already at the pollen stage. I don’t. I think they taste delicious, and I’m lazy. Edible when raw? Yes, though pretty bland and VERY green-tasting, especially in the more succulent base. If you’ve ever chewed on sweet grass, it’s a little like that. Cooking preferred. Worth the price of organic? Yes, if you can find them. 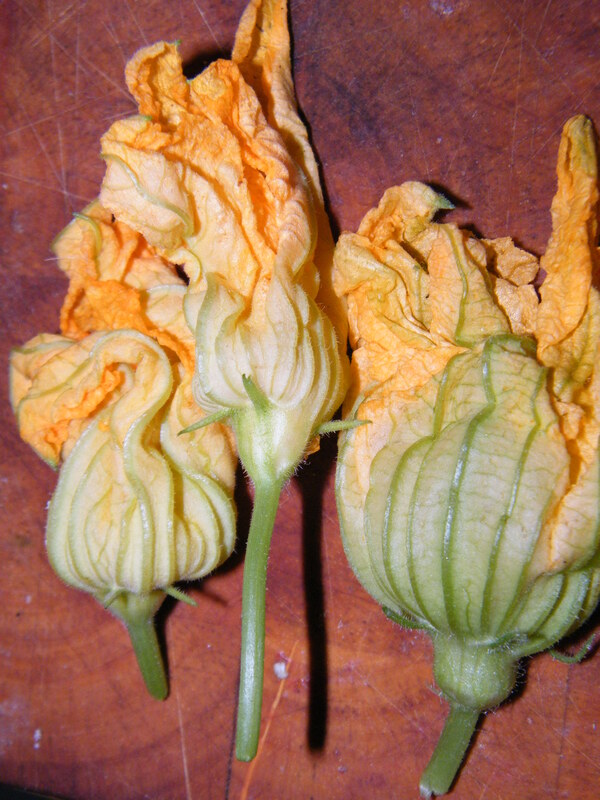 Squash blossoms appear for harvest before the more popular fruit, which means they appear at the stage in which even farmers who try to reduce pesticide use are probably doing one last pre-fruit spray. 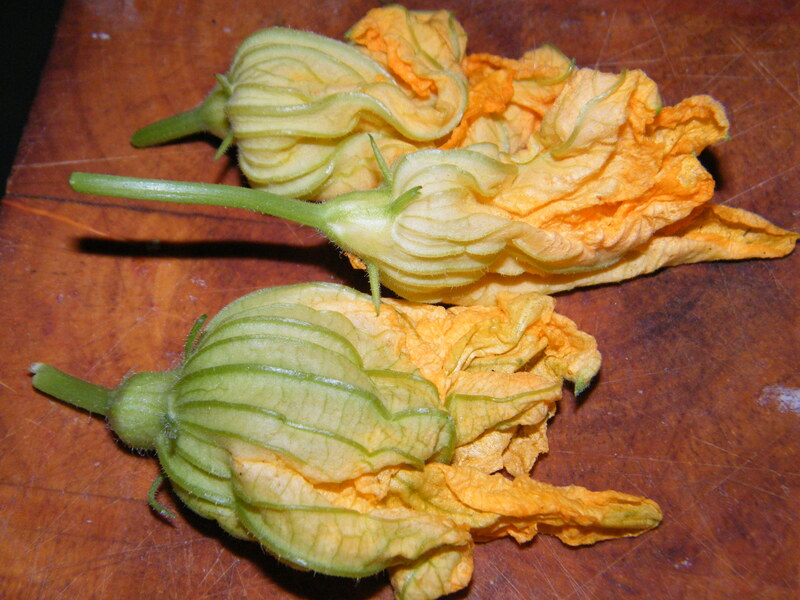 As a result, though, only really die-hard organic farmers are going to have organic squash blossoms, and they’ll cost you – they’re often used as bait to trap/lure bugs away from the zucchini themselves, so the blossoms get eaten to shreds by nature. In season: Early summer, and sometimes mid or late fall, a very brief window. If you see them, nab them. Best with: Soft cheeses (especially goat), shellfish, fresh herbs (rosemary, garlic, cilantro in particular), avocado. How to Store: They don’t store well. A note: don’t wash them. They’ll rot quite quickly. Brush out bugs with your fingers or a paper towel, and if they stems are long enough, place in a glass of water like you would any cut flower. Store in the fridge until they start to wilt, maximum 2-3 days. If the stems are short for water, a paper bag is best, but it makes little difference. You should eat them before the packaging has a chance to matter.